Athabaskiske språk er ei språkgruppe som blir snakka i dei vestlege delane av Nord-Amerika. Dei omtrent 40 athabaskiske språka blir snakka i Alaska, i nordvestlege Canada og i sørvestlege og vestlege USA av til saman bortimot 180 000 talarar. Det mest kjende av dei er navaho, som med 150 000 talarar er det største indianarspråket i USA. Athabaskisk er delt i tre greiner: Nordathabaskisk (i Alaska og Nordvest-Canada), Stillehavsathabaskisk (Oregon, California) og sørleg athabaskisk. Klassifikasjonen under er basert på Campbell 1997, Mithun 1999 og weblenkjene under «Kjelder». 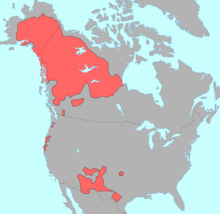 Marianne Mithun: The Languages of Native North America. Cambridge University Press, Cambridge 1999. Lyle Campbell: American Indian Languages. Oxford University Press, Oxford 1997. Joseph Greenberg: Language in the Americas. Stanford University Press, Stanford 1987. E.-D. Cook: Athabaskan linguistics: Proto-Athabaskan phonology., «Annual Review of Anthropology», 10, 1981, 253-273. E.-D. Cook & K. Rice: Introduction, in: Athabaskan linguistics: Current perspectives on a language family., Mouton de Gruyter, Berlin 1989, 1-61 ISBN 0-89925-282-6. E.-D. Cook & K. Rice (eds. ): Athabaskan linguistics: Current perspectives on a language family., Trends in linguistics, State-of-the-art reports (No. 15), Mouton de Gruyter, Berlin 1989. ISBN 0-89925-282-6. E.-D. Cook: A Sarcee Grammar. Vancouver 1984. V. Golla: Sketch of Hupa, an Athabaskan Language. Handbook of North American Indians; vol. 17: I. Goddard (ed. ), Languages. Washington 1996. H.-J. Pinnow: Die Sprache der Chiricahua-Apachen. Hamburg 1988. K. Rice: A Grammar of Slave. Berlin 1989. M. E. Krauss: The proto-Athabaskan-Eyak and the problem of Na-Dene: The phonology. «International Journal of American Linguistics», 30 (2), 1964, 118-131. M. E. Krauss: The proto-Athabaskan-Eyak and the problem of Na-Dene, II: The morphology., «International Journal of American Linguistics», 31 (1), 1965, 18-28. M. E. Krauss: Noun-classification systems in the Athabaskan, Eyak, Tlingit and Haida verbs. «International Journal of American Linguistics», 34 (3), 1968, 194-203. M. E. Krauss & V. Golla: Northern Athabaskan languages. In: J. Helm (ed. ), Subarctic, Handbook of North American Indians; vol. 6, Smithsonian Institution, Washington, D.C., 1981, 67-85. Denne artikkelen bygger på «Athapaskische Sprachen» frå Wikipedia på tysk, den 25. november 2012. Denne sida vart sist endra den 11. mai 2016 kl. 08:15.